College students need to think about careers and job prospects. The list below gives careers that have lost the most positions in the current recession. It does not mean they are bad career choices, just that you need to look at the overall job picture when deciding on a college major or career choice. 9. Accounting and similar jobs. It is not a great time to be graduating from college, but maybe the programs are a little less impacted as well. It never hurts to get a college degree, but you need to decide if your major is in demand, or will you do some serious job hunting. >>Tips for college graduates job hunting. >>Jobs college students can get now. Thinking about college and how to pay for it? Don't believe some of the myths about paying for college. Private colleges are more expensive-Not always. Many private schools charge more for tuition, but they have more money to give away as well. If you get admitted to a private college, they can offer you more money if they think you are worth it. That way, the out of pocket expenses for college go way down. Read more tips on getting more money from colleges. I don't need a college education-Maybe. But all studies show that college graduates outearn their non degree counterparts by a wide margin. Filling out a FAFSA does not do a thing-Wrong. You cannot get any kind of financial aid, including loans and many scholarships without it. I need to wait for my taxes to be finished-Wrong again. You can file as early as January 1, and can make corrections later if needed. The early college student gets the money. There just aren't any more scholarships for me-Don't bet on it. College scholarships abound. Read here for help in finding college scholarships. If you live alone, you are an independent student-Only under certain rules. If you are under 24, single, or a veteran, chances are you do not qualify as an independent student. 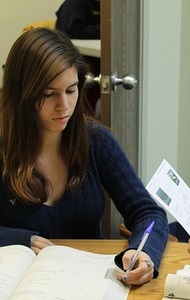 Read more financial aid information here. College students should not borrow money-Sometimes you can't help it. And you may need it to get you over the college money hump. But, don't borrow more than you really need. That's what college students should do--only borrow when you absolutely must. Here are tips on student loans. >>Read more college money tips on scholarships, financial aid, grants, and student loans. Borrowing money may be the only way that some students can go to college. However, watch out for your debt level. You don't want to be saddled with a ton of debt out of school. Here are some tips about student loans. Be sure and get your student loan application in early. Companies are not making as many student loans as they used to and government loans may be your only option. However, normally you get better deals with the federal government. If you get private student loans, read the repayment terms. They may be bigger or get bigger as the years go on. Before getting any student loan, do a reality check. Are you going to be making a big enough salary to justify borrowing large sums of money? Borrow as little money as you can while in college. Use your student loan money for just student related expenses. You need to shop around for the lowest rate and best deal on student loans. Don't take the only ones offered by your college. They are working with the lender to drum up business. Check out the many ways your student loan can be forgiven by working in designated loan forgiveness job. Look at all ways you can reduce or defer payments. >>Make your student loan cheaper. >>Tips to repay your student loan. College students normally have their majors in their heads before starting college. However, many make the mistake of picking something they really know nothing about, or a major that a relative told them to take. Here are some tips to help you decide on a college major. Don't pick a major just because someone else wants you to. You will have to live the major the rest of your life. Do something you want to do. Get to know everything there is to know about your major. -Find out your job prospects. -Talk to someone in the major and someone who has completed it. Do you really like a particular major, but find the classes may not be for you? Find out if there is an alternate route or another major that is close. There are many careers that many majors would get you to. Watch your grades. If you are not getting A's and B's in your major classes, you seriously need to think about switching majors. You don't have to lock yourself into a major soon. Yes, some colleges require you to declare a major around the first year of college, but you can switch. Talk to a counselor as to how you can change majors. When choosing a major, you must factor in all facets. These include your happiness, your monetary prospects, and whether you have what it takes to complete it. >>More college and college money tips. >>Tips for more college financial aid. Many students are in the middle of the school year and finding it hard to make ends meet. Especially as budget cuts across campuses are raising tuition. It may sound crazy, but have you considered taking a term off? There are actually some advantages. If you take a quarter or semester off, most colleges allow you to re-enroll for the one following, or even later, with no problem. Not going to school will actually save you cash. This is especially true if you can live at home with your parents for free. Do your parents pay your tuition? This is money they can save as well. If you get a job, and sock that money away for when you go back to college, you will actually be in better shape. Getting a job also allows you to see how you relate to the real world at this time. You may find that you can go up the ladder at your job and make a good salary. It also gives you a chance to see what the job market is and what jobs are in demand. This may alter your college studies and major. A job can give you some experience that may be useful later on. Graduate schools like to see some type of experience. There is no shame in skipping a term of college. It may just what you need at this time. Think it over and talk about it with your parents and see what happens. >>Finding a Job after Graduating. The college money blog will take a time out for a little fun. Four siblings, 18 years of age and quadruplets, have all applied and been accepted to Yale. This is the first time Yale has accepted quads. Their names are Ray, Kenny, Martina, and Carol Crouch and born two months premature. They are all seniors at Danbury High School in Connecticut. The quadruplets have not said whether or not they will attend, however. >>5 jobs college students can get now. If you have more than one student loan that you are paying on, you may be eligible for a student consolidation loan from the government. There are many benefits to putting your student loans one on. There is no minimum balance required on a student loan consolidation. You can reduce your student loan payments. Your new student loan still has flexible payments. The loan allows the same forbearance and deferments. You can apply for a student loan consolidation online here! If you come from a lower-income family, you probably qualify for two college grants. These grants come form the federal government. The first step for these grants or any financial aid is to fill out a FAFSA. Pell Grants are given out to each and every qualified college student. The grant at present time totals about $5,000 a year. If your family meets the income requirements, you will get it. There are various lower steps in the award for each amount of income over a certain amount. The Pell Grans are then paid to your college and they apply it toward tuition, fees, etc. If there is any money leftover after deducting all charges they can, you will get the rest. The federal government also awards Academic Competitive Grants to needy freshmen and sophomores in college. You must qualify with grades in high school and college. Talk to your counselor in high school if you are interested. First year college students get $750, second year $1,300. Chances are, if you qualify for the Pell Grant, you will also be eligible for the Academic Competitive Grants, so long as your grades are satisfactory. Again, check with your school or high school counselor. >>More information on student loans, grants, scholarships, and college money. It is time once again to think about selling your textbooks back or even online. If you choose to sell them back to the college bookstore, be sure and do it early. The first day of a college textbook buyback should be the day you are selling yours back. If not, they may not need the books you wish to sell back. Sometimes they will offer a bigger price at first, then drop it if they get too many. If you bought your books online, demand free shipping. If not, you chose the wrong online reseller of textbooks. Keep that in mind when you are buying textbooks. You can try to sell them via amazon.com, but you need to watch the shipping costs and many people sell books at rock bottom prices. Keep this in mind when needing to purchase books as well. Be sure and get a paypal account as well. This way you will get the cash right on the spot. You can try many different places online to sell your textbooks. Don't be greedy. You will never get anywhere close to what you paid. Cash in your hand is cash in your hand. If you want to sell your books at a high price, you will end up keeping them or throwing them away. Take what you can get quickly. If you sell too late, the demand will shrink and you will be stuck too. If you have a specific textbook for a class at your college that will be in demand, put up a flier around campus advertising it. You will probably get a better price than reselling it back to the bookstore, but you won't get as much as they are selling it for. >>More tips to save money on textbooks. >>Job interview tips for college graduates. >>Graduate school admission and scholarship tips. Because of the economy, college and state budget cuts, tuition rising, many students are looking for help in finding money for college. Beware that there are plenty of scams just waiting to take your money on false promises. Here are some tips. Deal with only reputable people who you know or are with a public high school or college. Find out what information there is from the counselors. They will have the real scoop on scholarships, loans, and grants. And they should all be free. That's right. Never pay for money to be sent to you. A sure sign of a ripoff is if you have to pay a "fee" to have the money sent to you. College grant scams are abundant with lines like, send us money and we'll guarantee money in the mail. Not going to happen. You may find that you pay for a scholarships search. Nothing wrong really with scholarship search services. The thing is, however, that all they do is give you information on scholarships that you could just research yourself for free. It does save you time, but may not be worth the cost of paying for just a list. But this is all they should promise you: Scholarship information. Anything about getting money for sure should be avoided. Nobody can promise you scholarship money, grants, loans, except companies and government agencies know to your college. If you pay for this scholarship information, by all means use a credit card. Rules for credit cards are pretty good for getting what was promised. You can cancel the purchase with probably a phone call and dispute the charge with your credit cared company. It is a little insurance against scams. The bottom line is, your counselors at high school and college will be the people who really know what is available to you. Remember, they want you to attend their college and will try and work with you if you are a top notch student! When you become a college student, sometimes your social life suffers. That is, you find yourself alone a lot, maybe even without a significant other. In college, you really do need friends to hang out with and talk. If something else blossoms, well, maybe that's icing on the cake. Here are the best places to meet people in college on a personal level. The dorm-You will see many people walking down the halls, maybe right across from you. Say hello and introduce yourself. If they are in the same dorm, they are perfect for creating a relationship, at least for the school year. Maybe beyond. Don't live in the dorm and be a stranger. You may need their help, and best of all for you, they may seek you out for help in college. The college library-This is where college students are usually hanging out alone. Wander the book aisles and look for someone interesting. Look at the books they are looking at and strike up a conversation. The classroom-College students like sitting in the same place during class. Pick a seat and see who pops up next to you. If you sit in the same place each time, and so do they, talk about becoming study buddies. A fraternity party-Frat parties are usually full of people. But we mention this only in passing. Frat parties are probably not the pace to find lasting relationships on college campuses. But, it does get you noticed by other students. The more fellow students you are around, the better chance of finding friends. The food court/cafeteria-See a student eating alone? Ask if you can sit next to them and then start a conversation. Talk about how lousy the food is or how what they are having. Be bold on campus-During warmer weather, you may see students by themselves, sitting on a bench or under a tree, and reading a book. Walk up and ask what they are reading and introduce yourself. Now we are not really talking about college romances here. You need friends of both sexes. However, if you meet someone, they may turn into something special for the school year and beyond. Make college fun and interesting while you are killing yourself studying! >College Money, Financial Aid, Student Loans, Consolidation, Scholarships. >30 college money savings tips. Travel from the college to and from home for visits during breaks. Moving costs of toting college needed items from one place to the other. College Text Books. Every college student knows they are expensive, but not really in tune with the cost until they purchase them. Cost of college fun like movies, eating out, and various college events. You can't stay in the dorm or library all the time. A new computer sometimes is a must for a new college student. Buy one that will last 4 years. You can probably now sit down and make up your own list as to what is an expense in college that you may not really think about. Click here to read more ways to save money in college and get more financial aid. >>College Students Car Insurance Discounts. >>Save Money on College Textbooks. Dorm rooms can add quite a bit to the cost of college. Many times, especially at public colleges and universities, the cost of a dorm can be more than tuition. Costs can be as much as $10,000 a year, with about one third of that being the cost of the meal plan. There ways of saving on the cost. When choosing a college, price may be on the top of your list. The difference between what some colleges charge for dorm rooms can be quite dramatic. Shop around and find colleges that offer cheap dorms. If you are set on attending one college, check the different prices of dorm options. Sharing a dorm room is much cheaper than a private one. You are not going to spend that much time oin your dorm, and most colleges allow you to pick compatible roommates. Remember that colleges with cheap dorms also will have the least amenities. Most will offer internet and wi-fi, but not air conditioning. Some colleges allow you to even share with more than one extra person, lowering the cost of dorm again. If your college has the option, investigate how much of a discount you can get for campus work. Meal plans are another cost. Getting the cheapest available plan, or even no plan, may be an option for many students who will not be eating cafeteria food much. However, some schools do insist on a meal plan. Also, many colleges will offer a bundle of dorm and meal plan for less if bought separately. If you want the most expensive dorm room, you should look into nearby housing and see if it is cheaper to live off campus. Especially if you can get roommates to share the costs. Remember that just because a dorm room is cheap, does not mean the tuition will be cheap as well. You need to look at the total cost, room, board, plus tuition to get an overall feel as to how expensive your chosen college is. Because regular college is becoming expensive, and many people are out of work, community colleges are becoming full. Out of work people are looking to learn a trade or take classes to enhance their employability. College students are looking save money and take cheaper classes. Most community colleges charge just a few dollars a unit, while 4 year colleges charge hundreds. This can be a substantial savings. Doing the first 2 years of a 4 year degree can save quite a lot of money for college. Many 4 year colleges and universities nearby offer a guarantee of acceptance to 2 year graduates. This is a great way to ease into a 4 year university. You do need to be aware of some things. The cost to live, eat, and buy textbooks is still the same. So it is not a free ride. Check with whether the class you are taking will indeed transfer to your college of choice. The only financial aid available most times from community colleges are state grants and student loans. Not much else except maybe work study. You still have to fill out a FAFSA. Since budget cuts are taking a toll, the classes you want may not be offered or full. Luckily, the same activities are available at community colleges like drama, music, and sports. Many specialties require just an associate's degree, like nursing. You can be a registered nurse with just a 2 year degree. Do some research for other sought after professions that accept 2 year degrees. A good way to save money is to stay at home right after high school and go to the local community college for 2 years. You can even get student loans and put them in the bank for later. Community colleges are a great option to save money and complete college. Many colleges have waiting lists, so apply early. >Teacher Resources, Teaching Articles, Teaching Tips. There are businesses that will allow you to set up accounts with them and get cash back for a college saving plan. Here are three of them. FutureTrustBankingCenter.com has a checking account that will deposit interest you earn into a 529 College Savings Plan. Fidelity.com has another 529 College Savings Plan associated with an American Express Card. You earn up to 2% cash back deposited in the account when you make purchases. Upromise.com is a program that is affiliated with literally thousands of retailers, drug stores, and restaurants. Make qualifying purchases and get up to 8% cash back put in a savings account. No, these programs will not send the average child in an average home to college alone. But every little bit of extra money for college can always help. You probably graduated college with a huge student loan debt. Now comes repaying it. Luckily, there are ways to make it easier. First, you have a grace period after graduation. 6 months or so, after graduating, they expect you to start paying off your student loans. This 6 months can come in handy. It allows you to look for a job without worrying yet about loan payments. After your grace period, there are other ways of getting a delay. If you have financial hardships, you can ask for another grace period. If you go to graduate school, you can get another deferment for that. Keep in mind, however, that your loan never goes away. You still owe it. Sometimes you will get an even bigger payment at the end. Interest accrues as well. If you get a job that is eligible, you can get a forgiveness of some of your certain loans. Click here for more information about paying off your student loan. It may sound simple, but be first in line. That is, have your FAFSA done and all your papers into the financial aid office as early as possible. If you are near the back, there may be no money left for you! Accuracy counts. Make sure you review your answers. Over stating your income will keep you from getting more financial aid. But don't under state it either. Just be honest and accurate. Let the financial aid office know of any circumstances in your family that makes you different financially than another similar student. if you can show hardships or other money problems, the financial aid office has the ability to up your award. But don't lie. You can also have colleges compete for you. If your current school or the one you going to has a lower award than another school, let them know. See if they will match it or make it better. Schools want to keep you as a student. If you are a young college student, you may think that you really don't need to be worried about health care. But this is false. College students can be most vulnerable if they have a serious accident and no medical coverage. Here are some tips for college students and health insurance. If you are on your parent's health insurance policy, you should stay. Most insurance companies allow children who are college students to remain on their parent's health insurance up to age 25. It is much cheaper to remain than get your own. However, if you are going to college outside the state, you should see if you can actually use the insurance in your college town and state. It may be best to have your parent's consult with their insurance company on the best options. If you cannot stay on your parent's insurance plan, here are more tips. If you plan on getting a job while in college, find out if your employer offers any type of health insurance. If you are part-time, you may pay more for the coverage, but still cheaper than going it alone. Of course, you should also check with your college or university. Almost all have some sort of fee they charge as a health fee. This may not be coverage, but may allow you to visit the on-campus health clinic free for minor illnesses. Some even offer more comprehensive health plans. Usually, you will need to be enrolled in a minimum number of units. If you still cannot get coverage, see if any organization you belong to, like a national fraternity, has available group plans to choose from. Medicaid. Under certain conditions, you may be eligible for medicaid. You will need to contact the office in the state your college is in to see if you can qualify. You do have the option of buying (or your parents buying) another health policy just for you. But, this is the most expensive option. You can also contact state offices to see what types of other group coverages are available. A group coverage is cheaper than solo. If your college is near a larger city or town, it may have a federally funded clinic or health office. Or, these institutions may offer low-cost coverage of their own. If prescriptions are a problem, many national chains offer some low cost prescription options. College students should not go to school without health coverage. This is a very bad idea. If you have a major accident, you will be in debt with medical bills, as well as having to make up missed classes. Insurance can't do anything for the missed classes, but they sure can make those medical bills cheaper. College students have very little money to spend on Christmas gifts. So, what are you going to do? Buying a Christmas gift just as a token is a waste of money. Here are some ideas for cheap Christmas gifts. Give a photo of you. A print a photo from your digital camera for less than a buck, then pick up a frame at Walmart or other store and you have a nice gift. College students have plenty of photos, right? Are you an artist or craft person? Make an original work of art. The cost of supplies can be very reasonable, and you may be able to make multiple gifts. As a college student, you may be able to pick up some free supplies at school. Write a poem, copy it in fancy handwriting or computer script and frame it. Offer your services. A friend or relative may need help with yard work, house work, or other chore. Even babysitting. Perhaps these few cheap Christmas gift tips will you get you thinking of even more. College students cannot afford to let Christmas leave them in debt or spending money on gifts that are not really needed. Even though you are a college student now and grown up, you will realize that thoughtful gifts are still the most appreciated. Remember, you need to get through college as cheap as possible. Saving money on gifts will help in the long run. >Get more college money tips, along with scholarship and financial aid advice here. Many students think they cannot get scholarships. Other students think that they will just breeze into a scholarship. The current economy has turned all of this around. You need to know exactly how you should go about getting a college scholarship. The first and foremost thing is to apply early! You need to be in on the first wave. If not, your scholarship application will never be seen, no matter how great it is. Find out when you can start applying for your desired scholarships. Many colleges are having cut-off dates and you need to get your FAFSA in ASAP. You can start filling it out in January. Be the best student you can be. In fact, be better than anyone else. Colleges pride themselves by having top-notch students. They want them! If you are the cream of the crop, a college WILL offer you a scholarship. In fact, many colleges will up your financial aid IF you are first class, and you have been admitted elsewhere. Your current school may not want to lose you and will offer you more. Another good tip is to apply for different schools, even if you are currently enrolled in a college. Transfer! No shame in going where the money is! Read more on making college affordable and getting college money. If you are a child or spouse of a military member, you may be eligible for college scholarship money. There are various agencies that offer grants and scholarships. Most branches of the service are covered. Don't forget that active duty military members are also eligible for the new GI Bill as a way to pay for college. >Learn about various military service member spouse and child scholarships and grants. With the cost of college rising, getting scholarships is what most students need in order to make college more affordable. First, check with your high school counselor for any scholarships they know about. They will guide you through the process. Second, look in your town for businesses or groups that offer local students scholarships. Third, check with your parents' employers for any scholarships they may offer to their workers and children. Remember to apply early, follow all directions when applying, and keep a very high GPA! Getting scholarships is not as hard as it seems, but it takes work. >Get more free information on finding scholarships here. Just because the economy has tanked does not mean you can't get money for college. But, you do have to think and do things differently. First and foremost, you need to think cost savings. You can save money by staying home and going to a local state or community college. The cost difference between that and moving away and staying in a dorm is enormous. Your family needs to know! Contact all of your close relatives who you have a relationship with and ask them for money. Yes, ask! Many relatives would love to help you out. Let them sponsor your books or other fees, as well as funds for a general budget. Get tips on saving on college textbooks. If you are going to an out of state or area college, don't apply to just one. Many colleges will offer a better financial aid package than the next one. In the end, it really does not matter much where you graduate from. Learn some financial aid secrets. Get a part-time job. This may sound awful, but many do just fine working and going to college. Jobs are tough to come by now, but many still exist for students. Come up with your own: babysitting, dog walking, etc. 5 jobs that college students can get now. If you or your family has extra financial burdens or situations, contact the college's financial aid officer. They are there to help you! Get good grades and apply for the colleges scholarships. Many have plenty of money for performance based in house scholarships and grants. >More financial aid advice and college money tips, click here. College can be very expensive and many students are broke. There are many things you can do to make college cheaper, as well as keeping money in your pocket. Kick bad habits like smoking. Do free activities on campus like movies and concerts. Get a cheaper cell phone plan and don't text a lot. Buy your clothes used from garage sales and thrift shops. Skip the expensive snacks and eat 3 good meals a day. If you live in the dorm, either use your meal plan or don't get one. These are just a few tips to save money in college. For 30 tips to save money in college, click here! The blog of http://needycollegestudents.com has been moved here permanently. To view the older posts, click here.